Flora and Mike were on North Uist again this week finalising the content and trigger points for our new walking tour along the Udal Peninsula. With the support of members of the Comunn Eachdraidh Uibhist a Tuath (the North Uist Historical Society) community involvement has been fantastic. Final touches are now being added and the App will be launched on izi.Travel in early July. The new App guides visitors out along the peninsula to the site of the Udal excavations and beyond. 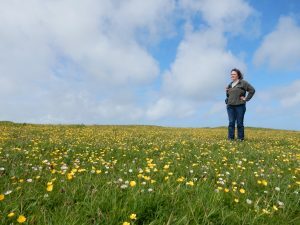 It covers the archaeology and natural history of the rich Machair farmland and dune systems. 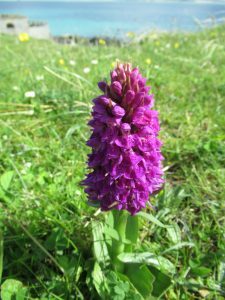 Unfortunately despite much looking at the amazing wild flowers we did not sight the rare North Uist orchid, D. majalis scotica – We will just have to go back!